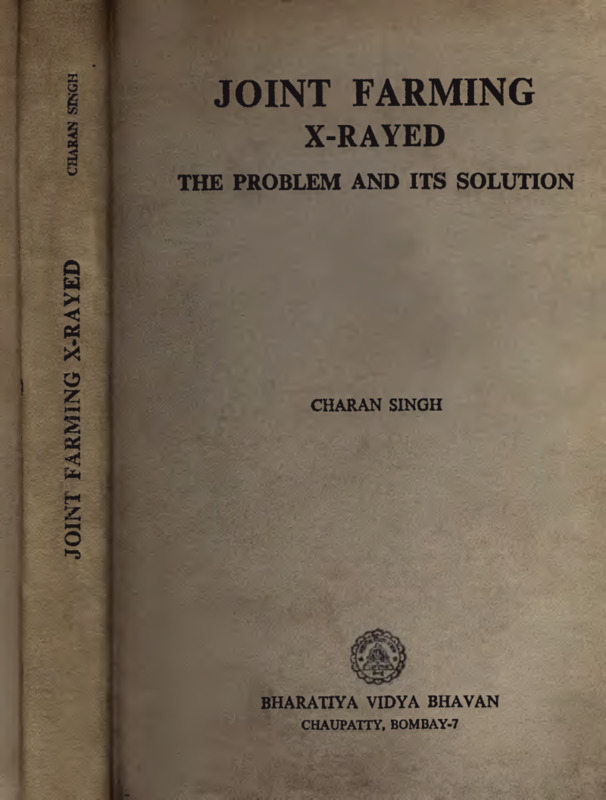 Publishes "Joint Farming X-Rayed: The Problem and Its Solution"
“ Our economists and planners, perhaps, do not take into account Indian conditions but are influenced by the theories of Karl Marx who concluded without due examination of facts that the laws regarding industrial development at which he had arrived, applied to agriculture also. In India the amount of arable land is limited and the population dense. The production per acre has, therefore, to be increased. In the USA, Canada, Australia and other such countries, the best results are obtained by large-scale mechanized farming, which increases the production per man, because plenty of land is available and labour is scarce. The other effects of the displacement of human and animal power by petrol and diesel on the economy of the country may be easily foreseen. Unemployment will be accentuated. In the circumstances of our country, industries and services cannot absorb the number of persons that will immediately be released from agriculture by any large-scale pooling of lands. Co-operative farming as an instrument of national policy has thus a very important human aspect. Import of machinery and motive power will strain the none too sufficient exchange resources of the country. It is not generally realised that, with the replacement of the bullock by the tractor, farm-yard manure will become scarce and increasing use will have to be made of chemical fertilizers. Evidence collected in this book will prove that the use of inorganic fertilizers tends to reduce soil fertility, even though the immediate results may be striking. Organic manure, on the other hand, maintains fertility and makes the soil an inexhaustible source of food supply. It is not without good reason that the agricultural experts of this country do not now advise unadulterated use of synthetic sulphates and phosphates. The country should not too hastily embark upon a venture for which posterity may condemn the present leaders. In short, large-scale farming will reduce production, injure the democratic principles which the country cherishes, invite bureaucratic control and lead to rapid mechanisation with all its consequences. Peasant farming, on the other hand, will enable the country to steer a path which may not be spectacular but which will ensure that it does not abruptly go off the rails. Our problems are staggering, indeed. Only if we realised them! We are faced with formidable impediments of lack of capital, miserably low ratio of capital formation to population growth, large-scale unemployment, still larger scale of under-employment, relatively inadequate land and other natural resources, insufficient agricultural production and an impatient population whose aspirations have been awakened and which is becoming increasingly conscious of poverty and economic differences. These problems will require all the energy, skill, administrative acumen and the statesmanship we are capable of. There is no example which India can follow in solving her problems because in no other country conditions were identical to ours. We can never attain the standards of the USA because our physical resources per capita are comparatively little, or those of the UK because we cannot build up an industrial structure as the UK did on the exploitation of foreign resources and foreign peoples. Nor can we hope to copy the methods of the USSR or China because, as apart from the far more favourable natural resources-man ratio in the former country and the balance-sheet of results in their totality in both, we have given ourselves a democratic constitution. The belief that our vast population is in itself a great asset an incentive for large-scale industrialisation, is unfounded. In view of the paucity of physical resources relative to population, our low purchasing power and the hard fact that capital or financial resources can ultimately be constructed out of physical resources, India’s huge population is an impediment to economic development or industrialisation — a definite liability, not an asset. “Promotion of innovations or technological improvements is as necessary as accumulation of capital. Only three centuries ago India stood, at least, on the same economic level as Western Europe. Today, things have considerably changed. The reason lies in the greater propensity of the Westerners to innovate. To that end impediments like illiteracy, ill-health, caste-system and a fatalistic attitude of life that most of our countrymen suffer from, will have to be removed. Then alone will the efficiency both of labour and available capital improve.